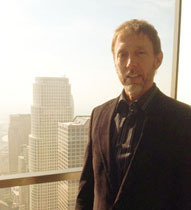 Our regular contributor Una Riley was in Vegas last month for us – this month she meets Chris Voss of Black Swan Group on the 51st floor of a downtown high rise in Los Angeles, at the renowned City Club. While I waited to conduct an interview I had managed to secure with Chris Voss a former FBI (Federal Bureau of Investigation) Agent, I could not help but take in the spectacular views across the city. Having arrived early I poured myself a coffee and sat back and soaked in the exclusive atmosphere of this prestigious private club. I had been informed that Voss was now a formidable character in the business world of negotiation. Not surprising, having spent 24 years as a special agent who was the FBI’s lead international kidnapping negotiator from 2003 to 2007 and assigned to the FBI Crisis Negotiation Unit (CNU) from 2000 to 2007. Voss is a recipient of the US Attorney General’s Award for Excellence in Law Enforcement and the FBI Agents Association Award for distinguished and exemplary service. During his career he worked many high profile cases which included the Jill Carroll case in Iraq. Carroll, a freelance journalist for the Christian Science Monitor, was released in Baghdad after being held in captivity for 82 days. Her kidnappers, a previously unknown group that called itself the Revenge Brigade, had threatened to kill her if all female detainees in Iraq were not freed. Voss was also involved in the 2006 Steve Centanni case in the Gaza Strip. Fox News correspondent Steve Centanni of Washington DC, and cameraman Olaf Wiig of New Zealand, were released after nearly two weeks as prisoners in Gaza. Before the journalists’ were set free, a video was released, showing Wiig and Centanni dressed in Arab-style garb. The kidnappers claimed that both men had converted to Islam. However, Centanni later told Fox: “We were forced to convert to Islam at gunpoint.” In support of their fellow journalists who had been seized in August that year, members of Palestinian Journalists’ Union gathered outside the parliamentary building in Gaza to demand the freedom of Centanni and Wiig. A further investigation Voss was concerned with involved Abu Sayyaf (‘bearer of the sword’ in Arabic) a militant group based in the southern Philippines that boasted of ties to the late Osama bin Laden’s al-Qaeda network, as well as the Indonesian network of Jemaah Islamiyah. Their aim was to create a separate Islamic state for the country’s Muslim minority. In 2001 Abu Sayyaf designated by the US State Department as a terrorist organisation, kidnapped 20 local and foreign tourists including three Americans, Guillermo Sobero and Martin and Gracia Burnham, from a beach resort in the Philippines. Sadly after a protracted pursuit that culminated in a bloody rescue by government troops, only Gracia survived. Another of the many kidnap cases that Voss worked on was the Gonsalves-Howes-Stansell case in Colombia which culminated in a July 2008 rescue by Colombian forces. The three men involved, Marc Gonsalves, Keith Stansell and Thomas Howes were American military contractors, captured by the Revolutionary Armed Forces of Colombia (FARC) when the single engine of their surveillance plane conked out and they crashed in the jungle. They were then held hostage from February 2003 to July 2008 until they were rescued in Operation Jaque, with other American contractors and 11 members of the Colombian security forces. On March 12, 2009, Gonsalves, Stansell and Howes were each awarded the US Secretary of Defense Medal for the Defense of Freedom. Over the years Voss has worked on about 150 kidnappings, worldwide, from the Middle East to Haiti. However, these days he is known as the founder of the Black Swan Group, that consults on business negotiation, kidnapping and terrorism. Among the essential concepts for responding and preparing for a kidnapping they also specialise in kidnapping avoidance, hostage survival and a corporation’s best response to a kidnapping event. The consultancy is based on applying the lessons of hostage, crisis and kidnapping negotiation to the business negotiation world. While reading through the plethora of achievements relating to Voss and sipping my coffee, basking in the sunshine radiating through the window on the 51st floor, I was distracted by voices. As I looked up there was Voss, he had rushed from another meeting downtown to meet me to discuss his role as a security professional. He is clearly a very busy guy. Having got the introductions out of the way I asked him if he felt that his former experience in the FBI prepared him for the wider world of business. He said: “Recently an international oil company invited us not only to talk about hostage negotiation but also business management. In business the principles of hostage and kidnapping negotiation are directly applicable to business negotiation.” Voss explained that kidnappers run their operations as a form of a ‘business’, albeit an illegal business, and as such one could say that they are governed by basic business principles. Negotiation tactics that disrupt businesses will disrupt kidnapping operations. He went on: “If a terrorist or criminal gang conducts a kidnapping, they have an expectation of receiving revenue in the form of a ransom within some expected time frame. If the time frame is continually extended beyond their expectations then the ransom victim becomes a form of inventory that is difficult to ‘turn over’ and therefore undesirable. Since the business has a ‘sunk cost’ in this ‘inventory’ they will not discard it, but will continue to bargain until it is ‘sold’. Therefore, the skills are highly transferable that I acquired in the FBI and now I apply them to business.” Voss also passes his expertise to others and is an Adjunct Professor at Georgetown University in Washington DC, at the McDonough School of Business teaching negotiation in the MBA programme. He is a past Instructor of International Business Negotiation at Harvard University, a member of the working group of the National Security Council and the US hostage negotiation subject-matter expert representative to the G8. Voss believes in cascading knowledge through his many appearances as an industry expert on TV and as a guest speaker over the years. He recalled the University of Virginia’s Critical Incident Analysis Group in the Spring 2005 conference titled ‘Hostage to Terrorism: Governmental and Non-Governmental Response Strategies’ and a Terrorism and Emergency Management Conference at John Jay College in New York City in 2002 where he spoke at length to an eager and appreciative audience. Voss has taught counter-terrorism, hostage negotiation and hostage survival internationally. He is also a graduate of Harvard’s Kennedy School of Government where he received a Masters of Public Administration in June 2008. Like many consultants in the business of security it is not easy to get them to talk about their clients or to divulge any information about jobs. As an expert negotiator, Voss is also a good listener and while ready to talk about general issues pertaining to his work he was not prepared to talk about specifics pertaining to business clients. I asked what the Black Swan Group specialised in and he said: “As it states on our website we are a strategic business advisory firm with a specific focus in negotiation. I have four full time employees and have worked with 16 different contractors on a variety of projects. Most of our clients come to us via introduction or referrals from people that I have worked with in the past.” I asked if he ever got called in by the public service that he once worked for. Voss replied: “Every government has to prove they can look after their own affairs … very rarely do they look to the people that have moved on for help.” We went on to discuss people that have moved in and out of public service like Bill Bratton who is now working as the NYPD Commissioner. Voss spoke about Bratton’s phenomenal talent, as a police officer and a business man and said that he was one of those exceptions to the rule. I asked Voss that now that he was a commercial businessman …did he miss the infrastructure of the FBI? He replied: “No I don’t. I like the challenge of going into unchartered territory. No FBI hostage negotiator has successfully taught the subject in MBA programmes and business schools. So I am taking it in a completely new direction and it is very exciting.” We talked about the teaching and cascading of knowledge through the various outlets from Black Swan to the academic outlets. I asked if the client base ranged from small business to global clients. Voss replied: “It is mostly global organisations or companies operating outside the USA. We are looking at business that it interested in investing in its own learning. Hostage negotiation skills within any business will make the company better at communicating with their own clients and makes them more effective internally. Probably 70 to 80 per cent of negotiations have nothing to do with price. Every negotiation involves one commodity … and that is time. Occasionally it involves both time and money and even when it is about both everyone thinks it is just about money … when in fact it is only about 25 per cent of the component of the negotiation. So the rest of us are mostly negotiating our time. The international oil company that we discussed got that concept and realised they needed more kidnap response training but they also identified the internal customer benefits.” I enquired if Black Swan had any partnerships in the UK. Voss replied: “I have some relationships in the UK already and we are at the point of scaling the business but I am always happy to entertain conversations.” Since swans are considered to be indigenous to the UK and Europe perhaps it is time that the Black Swan crossed the pond? Visit: www.blackswanltd.com. Meanwhile try also the book The Black Swan: The Impact of the Highly Improbable by Nassim Nicholas Taleb, on extreme and unpredictable events.